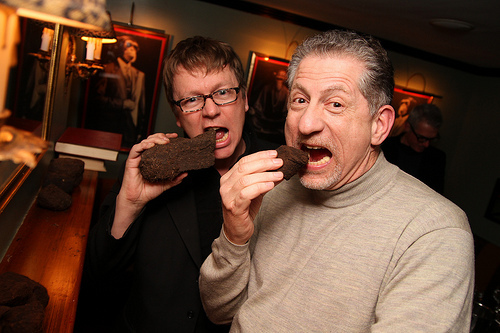 Martin Daraz, Highland Park brand ambassador, leads a toast at Highlands Scottish gastropub in the West Village. Photo by Phillip Angert. Now that it’s officially spring [despite the fact that I’m still wearing a sweater], I can say there was an overarching theme to my drink of choice this winter–a spicy, amber-hued theme. Considering that the winter of 2009-2010 has been more tenacious than in years past, I don’t think it’s too surprising that I’ve turned to Scotch whisky to keep warm and stay sane. Dr. Bill Lumsden of Glenmorangie attributes the warming effect to the amount of time the whisky sits in wood casks, which he believes creates a chemical reaction in the body. Hey, I’m with you there, Dr. Whisky, but if there’s any reason to have a little whisky science experiment, I’ll be a happy lab rat. If anyone wants to dig deeper into this “hot” mystery, let me know. Earlier this year, I veered from a 10-day veggie detox straight into the arms of The Macallan at “Flight Through the Decades” at SoHo House. 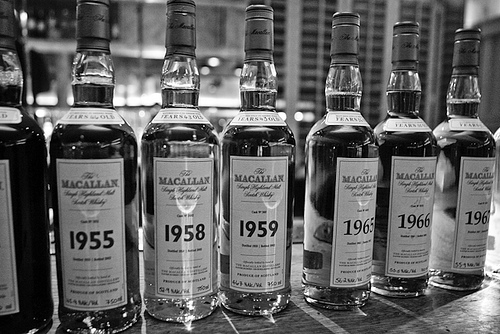 Graeme Russell, East Coast Brand Ambassador for The Macallan Single Malt Scotch, led a room packed with discerning bloggers (tweeting all the while) through drams ranging from fresh-off-the still new make spirit to 50- and 52-year old vintages. Each dish paired with the aged Scotch beautifully, and I had the added bonus of meeting NotCot, immaculate infatuation, cool hunting, and photographer cwhateyec (check out more photos from the event here). It was definitely a luscious (or is it lush-ous?) way to ring in a new year of drinking! Then to kick off February, I sat in on “For Peat’s Sake,” a roundtable discussion at Beekman Bar & Books, listening to some whisky scholars (aka fanatics) discuss the finer points of peaty Scotch. 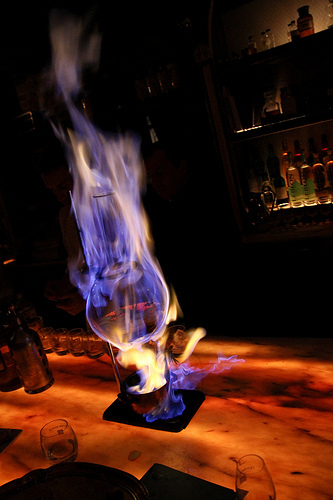 Peat – dried bricks of decayed bog vegetation, historically used as fuel in Scotland, is roasted during the distillation process, leaving a smoky, spicy essence unique to the region. John Henry of Pipeline Brands moderated the meeting of minds, and speakers included Sam “Dr. Whisky” Simmons (brand ambassador for Balvenie), Jeffery Karlovich (Whisky Life magazine, Whisky Guild social network), Robin Robinson (brand ambassador for Compass Box), Peter Silver (Malt Maniacs), and Simon Brooking (brand ambassador, Ardmore and Laphroaig). It was a treat to sit by the fire and learn about peat’s earthy flavors and hear how China and India are flooding the demand for peaty Scotch. To learn more about what we drank, head over to Teleport City – Keith Allison took way better notes than I did. And I can’t believe I tasted $4,000 Scotch during the launch of Highland Park’s limited edition 1968. Please show my Examiner page some love for the details on that one – let’s just say it was one elegant evening that quickly took my mind off that evening’s monsoon. And just when it seemed like seasonal affective disorder might kick in, Glenmorangie came to the rescue with an “Inside the Whiskey Maker’s Lab” tasting at Apotheke. Signet, Nectar D’Or, a fire show by Albert Trummer – if that doesn’t take the edge off during winter in NYC, well I don’t know what will. And unfortunately I missed the lovely “Women & Whisky” fundraiser earlier this month sponsored by Compass Box Whisky and LUPEC NYC at Astor Center, but I heard it was a smashing success. Check out Wine Mag for a roundup the drool-inducing whisky cocktails I missed out on – sad I couldn’t make it. So long as this cool weather lingers, I’ll be reaching for that aged, amber dram… and I’m not complaining! Looking for a dram? 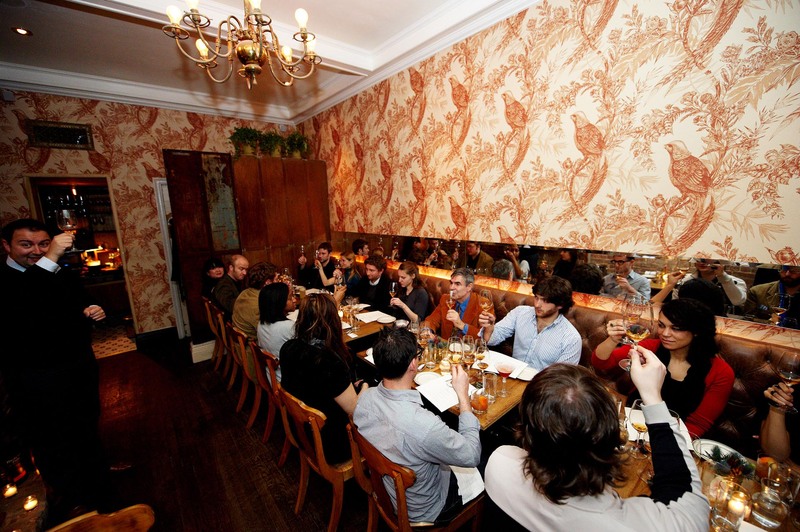 Here’s a list of some of the best whisky/whiskey bars in NYC. 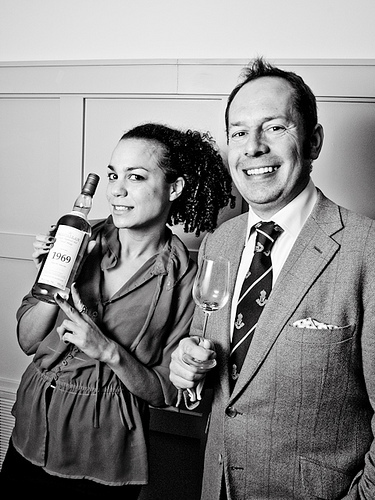 Simon Brooking (Ardmore and Laiphroaig) and Robin Robinson (Compass Box) get peaty with it. Photos by Lush Life Productions. 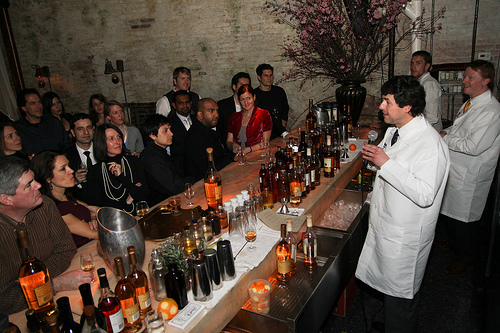 Dr. Bill Lumsden of Glenmorangie dishes the latest whisky research at Apotheke. Albert Trummer knows how to kick it up a notch at Apotheke.